The only solution to resolve the SAITM Malabe Medical Faculty issue was to abolish it and not appointing various Commissions to come up with different solutions, the Inter University Students’ Federation (IUSF) said today. IUSF Convener Lahiru Weerasekara said it was the responsibility of President Maithripala Sirisena to abolish the private medical university. “The President’s political alliances and affiliations are not important in this issue. It doesn’t matter whether he holds the power or not. As the first citizen, he should intervene and abolish this university without appointing Commissions,” he told a news briefing. He further said that implementing the recommendations made to Parliament by the committees appointed by President Sirisena during his tenure as then Health Minister could have solved the matter rather than hand the matter to another Committee. He said the entire period the President kept silent leaving the country’s matters aside. What arrogance. Should he not be charged for threatening the President and govt. This insignificant swollen headed brat with a following of misguided brainless good fo nothings. Good example is Vietnam having communist regime but started their economic reform about two decades ago.. Now it has one of best FDI's in the world.. RMIT is one o the early uni's to come up in HCMC....Look at SL having a open economy and being a democratic country...Protests are not allowed in Vietnam and governed by elected people not mob on the Street.. They do what's best for the country I still believe SL need a strong leader like MR but preferably less corrupt to move this country forward and hopefully keep these maniacs under control like Got a did..
Look at this pathetic guys state! Get lost loser! He is not a medical student. 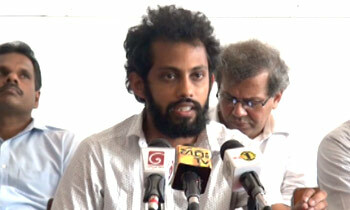 He represents the JVP and has failed his degree several times. This is all he is capable of doing. Forcefully disrupting the studies of genuine students who have no voice. If they oppose, they are threatened. Have a look at this man. Would you allow him to give you or your family medical treatment? I can not understand how this guy is studying to be a Medical Doctor when he can not have any understanding of another persons situation.Abolishing SAITM is pointless and put all SAITM students future in jeopardy.Best option is to implement proper guidelines / supervision and start accepting SAITM students after completion of a government supervised examination. Everyone was waiting for this chap's advice to close SAITAM!! This guy is indirectly threatening the executive!!! I don't know why they think they are entitled to free education when its the right of the taxpayers (who elected representatives to parliament) to decide on how their money is to be spent. High time we ask them to pay back. Come-on folks, lets agree to a common exam to test the quality of graduates and then call it a day.Equality is not something that will be accomplished anytime soon. You guys are a tiny population of the whole country cannot decide the education policy for the country. First abolish Z score. Then this problem is solved. After getting free education right through, they don't like others to similar education and qualifications even after paying. Want a pathetic lot. Who they think they are to decide country's education policies? If you say only solution is to abolish SAITM, what about the students already studying there. Are you going to give them education at an alternative place or are you guys going to return their payments and the time they have spend at SAITM. All brunch of crooks where were you guys when MR granted the relevant permission ? Did you guys get any lump sum from MR during his tenure not to drag this issue. Who made this clown a god? Looks like the rise of the JVP of the eighties is imminent. We are heading for the dark ages again with militants like this dictating terms to an elected government. Better solution is abolish IUSF and we the taxpayers find alternate way to educate decent sri lankan youth who value what education they get for no expense to themselves. I WOULD LIKE TO KNOW, HOW MUCH HE IS PAID FOR THESE STATEMENTS. BY VIRTUE OF BUSINESSMEN'S POWER HE IS TRYING TO DESTROY POOR CHILDREN'S EDUCATION. .
Why won't you tell this to SLMC. They are the people who block others sitting for a common exam. "they would knee down the people who are trying to privatize the FREE education system. " Since this person has nothing better to do than stir up trouble why didn't they cast him in the role of Wijeweera instead of Kamal Addararachchi? He even looks like the terrorist! Very poor understanding of democracy, economics, social policy, nation building. How is this person become a medical student? Why is tax payer money used to fund his education? Wow. Great logic, brain power! How did this person get into University?